What is an MG, you ask? Well, if you need to ask, you probably don't need to be looking at this page. Simply put, MG is a marque of British sports cars that was in production in the 1940-1970s. It returned to production in 1995 with the MG F which is, sadly, not available in the United States. Check out the links below for more information. Not much to tell, really. 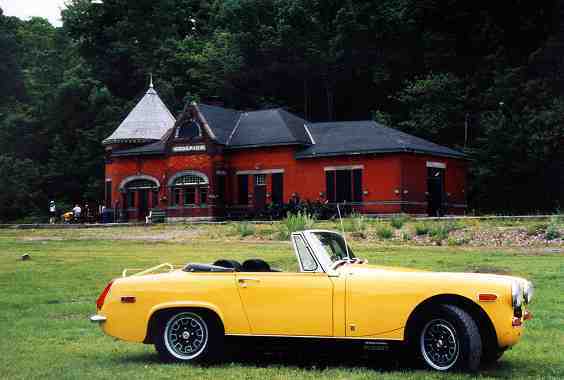 I'm the owner of a 1970 MG Midget which I'd been unable to drive for over five years -- when I'd moved out of the USA. But I'm back now and it's running again! This picture was taken at an old rail station in Canada (Godrich, Ontario if I'm not mistaken). I believe I'm the third owner of this car, the first being some guy from Florida (hence the Scuba Diving sticker that was on the back when I bought it) and the second being some guy from southeastern Michigan. He had gotten married and ending up deciding to sell the car in order to<gasp> build a deck on his home. Will I end up with the same fate, I wonder? Purists will note that this is not a stock MG color and if you can correctly identify the name & year of the type of car that actually wore this color, I grant you the title of Paint Master Extraordinaire.